Your favorite all-in-one glue and sealer just changed the game! The new Mod Podge Ultra is a water-based spray that’s multi-surface, scratch resistant, and non-tacky. We’ve partnered with Craft Hangout to show you the versatility and innovation behind our newest product which is available in glossy and matte finishes. Enter for a chance to win this self-leveling wonder and other Plaid products in an Ultra prize pack worth $100 on Instagram! Just click on the Instagram post below to get started. Giveaway begins on January 28, 2019 and ends on February 08, 2019 11:59 PM EST. See full terms & conditions at the end of this post. Want to try your hand at the Craft Hangout's latest projects using Mod Podge Ultra and Mod Podge Photo Transfer? Check out the tutorials by these crafty co-hosts below! Note: Mod Podge Ultra is available at major retailers and Plaid Online beginning March 5th. 1. 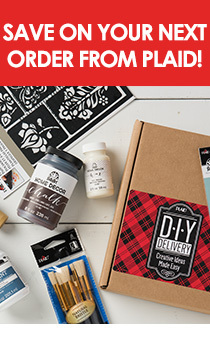 Promotion Description: The Mod Podge Ultra Giveaway ("Sweepstakes") begins on 01/28/2019 at 12:00 AM (Eastern Time (US & Canada)) and ends on 02/08/2019 at 11:59 PM (Eastern Time (US & Canada)) (the "Promotion Period"). By participating in the Sweepstakes, each entrant unconditionally accepts and agrees to comply with and abide by these Official Rules and the decisions of Plaid Enterprises ("Sponsor"), which shall be final and binding in all respects. Sponsor is responsible for the collection, submission or processing of Entries and the overall administration of the giveaway. Entrants should look solely to Sponsor with any questions, comments or problems related to the Sweepstakes. 3. Winner Selection: The winner of the Sweepstakes will be selected in a random drawing from among all eligible Entries received throughout the Promotion Period. The random drawing will be conducted within 48 hours by Sponsor or its designated representatives, whose decisions are final. Odds of winning will vary depending on the number of eligible Entries received. Winner will be notified by Instagram with confirmation via email at the email address provided on or about 48 hours after the random drawing. Potential winner must accept a prize by email as directed by Sponsor within 48 hours of notification. Any winner notification not responded to or returned as undeliverable may result in prize forfeiture. The potential prize winner may be required to sign and return an affidavit of eligibility and release of liability, and a Publicity Release (collectively "the Prize Claim Documents"). No substitution or transfer of a prize is permitted except by Sponsor. - One (1) winner(s) will receive: One (1) gift basket containing products from Sponsor to include, but not limited to, Mod Podge Ultra and other craft products and supplies. Approximate retail value or "ARV": $100. Extra entries will be awarded if users tag three (3) friends in the original contest announcement posted by @CraftHangout. 8. Winner's List: To obtain a copy of any legally required winners list or a copy of the Official Rules, send the applicable request and a self-addresses, stamped, #10 envelope to Plaid Enterprises cc: Mod Podge Ultra Giveaway at PO Box 7600, Norcross, GA 30091. Request must be received no later than 48 hours + 6 MONTHS for the name of the winner and, by the end of the promotion, for a copy of the rules. - The prize is total $100 value. - Users profile must be made public.